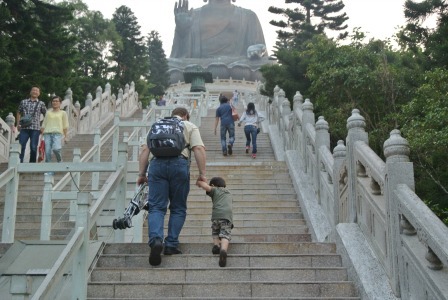 Although Hong Kong kids travel kit is specially written for parents traveling with child(ren) 6 years old or younger, there are still some items on this list would be a great reference and guideline for any parents with child(ren) before teen. This is the supplement of the Hong Kong travel kit which is for anyone traveling without any children. Please feel free to adjust their priority or your needs on this list. You can also download the Hong Kong travel kit check list by clicking here. Children at 5 or below may need a nap in the afternoon. When they get tired, it is much easier to put them in a stroller than holding them. Another purpose for us is because we sometimes need to run from one terminal to another in the airport in order to get on the connecting flight. With a stroller, it will definitely run faster. Ocean Park and Hong Kong Disneyland do have strollers for rental. But you must pick it up at the entrance. You can't rent it in the middle of the theme park. However, bear in mind that every time when you step into an exhibit, you must leave the stroller outside, rent or not, while you are in either one of these Hong Kong attractions. We L.O.V.E. this product very much. Children at 5 or below, a regular seat belt may not be enough for them because their bodies are too small. I don't think that any parents would like to take a car seat along on top of the backpack, hand carry and luggage. This seat-belt-like product is perfect. It is super light in weight and small that you can take along in your backpack. The most important of all, it ensures the safety of your little one. If you have any mobile devices, such as tablets and/or smart phones, you may wonder why you need a portable DVD player. If you come from the States, it is very expensive to have roaming service when you travel overseas. So, having your phone or tablet to get the internet access in case there is no wi-fi, it is very costly. Therefore, you are better off with a DVD player. Why do you need a set of headphones? If you were other passengers in the same flight, you don't want someone sitting near you having the DVD player blasting, right? I found that a stuffed toy your chil(ren) sleeps with every night will bring a lot of comfort for a young child, especially in the new environment or hotel. This could consist of tons of things, such as tissue paper, wipes, hand sanitizer, toothpaste, toothbrush and so forth. In my opinion, based on what you need and age of your child(ren) to pack this. But tissue paper, wipes and hand sanitizer are always on my list. A suggestion for you to decide what you should pack.....Considering if you were in an emergency that you can't even wait to go to the nearest store even it is just 5-minute walk away. Then, those are the things that you must bring along with you. A couple bandages in your bag won't hurt. Without a plastic bag with us, I truly didn't know what we were going to do with the dirty clothes. Besides, if someone gets sick where it is so far away from the bathroom, a plastic bag comes in handy. You will not believe the wonder a plastic bag does. Again, this is the list I developed based on our experiences before and after having our child. You don't need to follow the complete list. But please feel free to adjust to fit you and your family needs. You can also click here to check out the main list of Hong Kong travel kit. To download the Hong Kong journey planner check list, please click here.